Background: Poly(methyl vinyl ether-maleic acid) (PMVEMA) is a water-soluble, biodegradable polymer used for drug delivery. The aim of the present study was to prepare nanofibers of this polymer as a fast-dissolving carrier for montelukast. Materials and Methods: Polymeric nanofibers were spun by electrospinning method using different ratios of biodegradable polymer of PMVEMA. The processing variables including voltage, distance of the needle to rotating screen, and flow rate of the solution were optimized based on the diameter of the nanofibers, drug content, and release efficiency by a Taguchi design. The morphology, diameter, and diameter distribution of the nanofibers were studied by scanning electron microscopy (SEM). Drug loading and its release rate from the nanofibers were analyzed spectrophotometrically. The possible molecular between the polymer and the drug was characterized with Fourier-transform-infrared spectroscopy. 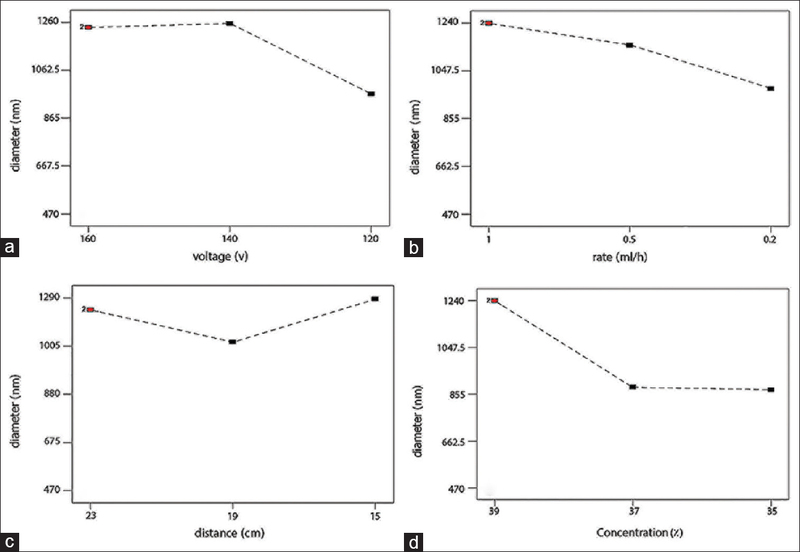 Results: The results showed the best situation for electrospinning of the polymer obtained at the polymer concentration of 37%, the distance of the needle to rotating screen of 19 cm, the voltage of 120 kV, and the rate of injection of 0.2 ml/h. In these situations, the fiber diameter and drug loading efficiency percentage were 273 nm and 83%, respectively. These nanofibers released the total loaded drug within 1–3 s with no residue in the dissolution medium. SEM results showed that the optimized nanofibers were quite smooth and without beads. Conclusions: The results indicated that the nanofibers of PMVEMA could dissolve the drug very rapidly and can be adopted for fast-dissolving dosage forms. Poly(methyl vinyl ether-maleic acid) (PMVEMA) is a water-soluble, biodegradable polymer used for drug delivery. It is a typical polyanhydride polymer with great potential in biomedical application. It is well established that the maleic acid copolymers have a broad spectrum of biological activities which include antitumor activity, interferon inducing, wound healing and anti-inflammatory, antiviral, and antibacterial activities. Conjugation of this polymer to PEG and antisense oligonucleotides has been successfully used to treat inflammation and tumors in mouse models., Moreover, it is used in encapsulation of calcitonin. Montelukast is a CysLT1 antagonist, which binds to cysteinyl leukotriene receptor CysLT1 of the lungs and bronchial tubes and in this way blocks the effects of leukotriene D4. This mechanism alleviates the inflammation and bronchospasm in asthma. It is usually administered orally. To enhance the onset of action of this drug and fast sedation of the signs of allergy and bronchoconstriction of asthmatic patients, recently, fast-dissolving tablets  and films  of this drug have been developed. However, in both of them, it took at least 30 min to dissolve the drug. On the other hand, the very thin diameter and porous structure of nanofibers help the drug to have a more effective exit in the nanofibers than in films. The most famous and low cost method to build polymer nanofibers is electrospinning method. Many polymeric electrospun nanofibers have been used so far for fast-dissolving buccal dosage forms. Among them are the electrospun polyvinyl-alcohol nanofibers for delivery of caffeine and riboflavin, polyvinylpyrrolidone nanofibers were also used as a fast-dissolving delivery system for paracetamol and caffeine, and sedative nanofibers of this polymer were also electrospun in a core-shell form by coaxial electrospinning technique. The process of using electrostatic forces to form synthetic fibers has been known for over 100 years. Electrospinning process utilizes a high voltage source to inject an electric charge with a specific polarity to a polymer solution, where fibers accumulate on stacker surface with opposite polarity. Despite the relative ease of electrospinning, a number of processing parameters can greatly affect fiber formation and structure. These parameters include polymer concentration, applied voltage, polymer flow rate, and needle distance to the collector plate. In addition, all the four parameters can affect the formation of beads. Therefore, we tried to use the PMVEMA polymer for production of fast-dissolving nanofibers for the first time since there is no report of its use in electrospinning. In this regard, the aim of the present study was preparation of the nanofibrous mat by PMVEMA and loading them with montelukast to produce an antihistaminic and anti-inflammatory drug. This water-soluble polymer is biodegradable and biocompatible and has not been used so far for electrospinning of nanofibers, especially as a fast-dissolving drug delivery system. PMVEMA, dimethylformamide (DMF), and other reagents were purchased from Sigma Company (USA). Montelukast was provided by Morepen laboratory (New Delhi, India). To optimize the processing parameters of electrospinning of nanofibers, a Taguchi design was used by Design expert software (Version 7.2, Stat-Ease, Inc. Minneapolis, MN 55413-2726, USA). In the first stage, PMVEMA was dissolved in DMF at a concentration range of 35–39 w/v%, and different situations of electrospinning were examined to get the best conditions for obtaining nanofibers with the least beads and diameter. Solution injection speed was set between 1 and 0.2 ml/h, the voltage applied was 12–16 kV, and the needle distance to the rotating surface was 15–23 cm. The polymer solution was stirred for 20 h on a stirrer at 500 rpm. The final transparent solution was transferred to a 1 ml syringe attached to a 22-gauge needle. The final fibers were collected on an aluminum surface. All procedures were performed at 25°C. Different studied situations of the processing parameters are summarized in [Table 1]. After optimization of the processing parameters of electrospinning, the optimized nanofibers were prepared with 37% of PMVEMA containing 20% of montelukast (according to the polymer content), and the drug release test was carried out as the method mentioned in section 2.6. Nanofibers were coated with gold under vacuum in an argon atmosphere and their morphology was studied using a scanning electron microscope (SEM) (LEO 440i, UK) with magnification of (×600–1000k). The average fiber diameter of each sample was measured in the resulting image. In each image, at least 100 different points were randomly selected and their diameter was measured by Digimizer software (MedCalc Software bvba, Ostend, Belgium). The Fourier-transform infrared (FT-IR) spectra of selected samples were obtained using the FT-IR device (Perkin Elmer, Waltham, MA). Samples were prepared by potassium bromide (KBr) and scanned against a blank KBr disc at wave numbers ranging from 4000 to 450 cm −1 with a resolution of 1.0 cm −1. The mat of nanofibers was cut into pieces of 2.5 cm × 2.5 cm, and drug release was measured by immersing a certain weight of the mat in 10 ml of phosphate-buffered saline (at 7.4 pH) containing 0.5% Tween 20 under constant stirring at 300 rpm at 37°C. An equal amount of the free drug was also tested under the same conditions. At particular time intervals, a 50 μl sample of the release media was removed, and the concentration of the drug was measured using ultraviolet spectrophotometer at λmax= 237.5 nm. After each sampling, the same amount of fresh buffer was replaced in the release media. Each test was repeated in triplicate, and the mean values were reported. Different processing conditions were studied and their impacts on the diameter of the nanofibers of this polymer were obtained. As shown in [Table 1], the diameter size of nanofibers of PMVEMA varied between 400 and 1000 nm. Statistical analysis by ANOVA test followed by the least significant difference analysis showed a significant difference between all formulations (P < 0.05) except for 5, 6, and 9. [Table 1] summarizes that the applied voltage varied between 12 and 16 kV. The effect of changing the voltage on the diameter of nanofibers is shown in [Figure 1]a. This figure depicts that decrease in the voltage reduced the nanofibers' diameter size. At voltages of 14 and 16 kV, the fibers' diameter did not change, but when the voltage reduced to 12 kV, the diameter reduced statistically significantly (P < 0.05) [Table 1]. Injection rate of the polymer solution was changed between 0.2 and 1 ml/h. According to [Figure 1]b, by decreasing solution injection rate, the diameter of nanofibers reduced. [Table 1] summarizes that the distance of the needle to the rotating plate was changed between 15 and 23 cm. [Figure 1]c shows that the best distance for polymer fibers electrospinning which caused the least nanofiber diameter was 19 cm. [Table 1] shows that the polymer concentrations used in this study were between 35 and 39 w/v%. [Figure 1]d shows that, by reducing the concentration of PMEVMA, nanofiber size can also be reduced. Finally, according to the Design Expert Software optimization, the best conditions for electrospinning of PMVEMA nanofibers were predicted to be at the concentration of 37%, distance of 19 cm, voltage of 12 kV, and injection rate of 0.2 ml/h. The nanofibers were electrospun at these conditions, and the average diameter size was measured to be 273 nm. [Figure 2] depicts the SEM of these optimized nanofibers and also the other formulated nanofibers mentioned in [Table 1]. To study the effect of the different concentrations of the drug on the diameter of the nanofibers, three different concentrations of the drug including 10%, 20%, and 30% were incorporated in the polymer solution and the fibers were electrospun at the optimum aforementioned situations, and the diameter of the fibers was determined. [Figure 3] shows that incorporation of the higher concentrations of the drug resulted in growing of the fiber diameter due to enhanced viscosity of the electrospun solution. After optimization of the processing variables of electrospinning of PMVEMA nanofibers, the optimized nanofibers were loaded with 20% of montelukast (according to the polymer weight), and drug loading efficiency and its release profile were studied. The results showed that 83% of the applied drug was loaded in the nanofibers, and the total loaded drug was released immediately in <3 s. The nanofibers were completely dissolved within this time and deteriorated completely. [Figure 4] compares the dissolution profiles of the free montelukast and the loaded form of it in the optimized nanofibers. FT-IR spectra of free montelukast, PMVEMA, montelukast-loaded nanofibers, and blank nanofibers are depicted in [Figure 5]. 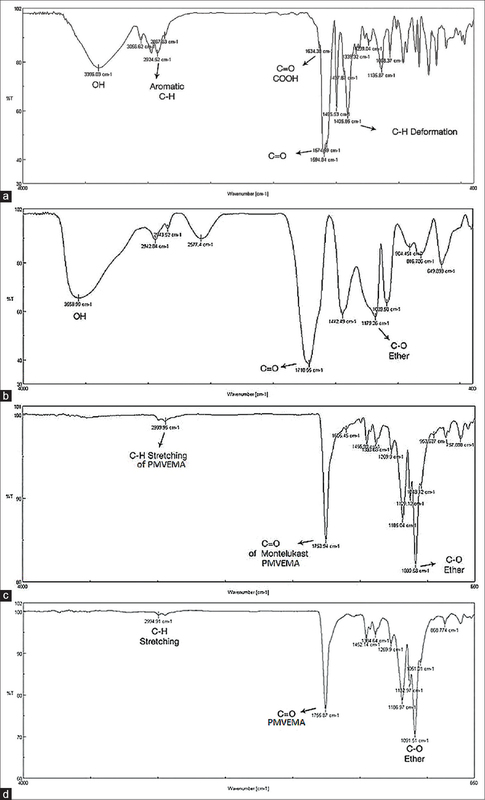 For free montelukast [Figure 5]a, the tertiary hydroxyl groups have exhibited a broad peak around 3300 cm−1 and a carboxylic acid peak which is in the form of a salt which has exhibited a strong peak near 1600 cm−1. Numbers of aromatic C-H peaks are also observed between 2900 and 3000 cm−1. In the spectrum of PMVEMA [Figure 5]b, a broad absorption band at 3420 cm−1 corresponds to the hydroxyl group of this polymer, and the absorption band at 1716 cm−1 is assigned to its carbonyl group. 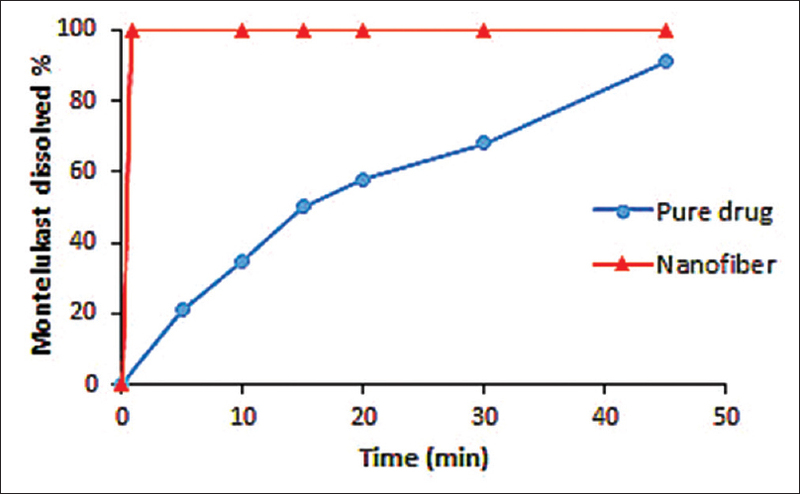 In both drug loaded and blank nanofibers [Figure 5]c and [Figure 5]d, the characteristic peak of C = O which is seen at near 1700 cm−1 relates to the carboxylic acid groups of montelukast and PMVEMA, but absence of hydroxyl group around 3300–3500 cm−1 which was seen in the spectra of these substances probably indicates a strong hydrogen bonding between them in the nanofibers. No beads were seen in the optimized nanofbers [Figure 2]. At low concentrations, solvent molecules tend to congregate and create spherical bead shapes due to the low surface tension of the solvent. With an increase in concentration, the viscosity of the solution increases, which can transfer bending instabilities to a farther distance than the tip of the needle. Incorporation of the higher concentrations of montelukast in polymer solution resulted in growing of the fber diameter due to enhanced viscosity of the electrospun solution [Figure 3]. The optimized nanofbers were loaded with 20% of montelukast (according to the polymer weight). The results showed that 83% of the applied drug was loaded in the nanofbers, and the total loaded drug was released immediately in <3 s. The nanofbers were completely dissolved within this time and deteriorated completely [Figure 4]. FTIR studies probably indicated a strong hydrogen bonding between PMVEMA and montelukast in the nanofbers [Figure 5]. PMVEMA polymer is electrospun for the first time in this study. DMF and other solvents such as hexafluoro 2-propanol have been used as solvents for electrospinning of PLGA nanofibers., DMF is a solvent with high dielectric constant (ε = 36.7) and has highly been regarded as a suitable solvent for electrospinning process. In the present study, this solvent was used as it could dissolve both components, i.e., PMVEMA and montelukast. Different processing conditions were studied and their impacts on the diameter of the nanofibers of this polymer were obtained. The applied voltage varied between 12 and 16 kV. Decrease in the voltage reduced the nanofibers' diameter size [Figure 1]a. The applied voltage power controls the formation of nanofibers with diameters of a few microns to a few nanometers. Low voltage less than the optimal amount leads to the formation of beads in fibers or even jet is not formed. There is always an optimal range of voltage depending on the polymer system and solvent that can be neither too weak nor too strong. Deitzel et al. studied the nanofibers of polyethylene oxide (PEO) using water as the solvent. They showed that, by increasing the voltage level, Taylor-cone surface shape changed and jet fibers were formed. Meechaisue et al. applied different voltages to examine its effect on the structure of poly (desaminotyrosyl-tyrosine ethyl ester carbonate) nanofibers. They used voltages of 10–25 kV at a concentration of 15 w/v% of the polymer solution and observed that, in the voltages <20 kV, beaded fibers were formed, whereas almost smooth fibers were obtained in voltages >20 kV. Increase in voltage from 10 to 15 kV reduced the beads in the nanofibers, while increasing the voltage from 20 to 25 kV increased the fibers' diameter from 1.9–2.2 μm. By reducing the voltage and approaching the critical voltage, deceleration of jet and weaker electric field lead to an increase in the migration of the jet electrospinning. Longer migration time leads to applying stretching and elongation more before reaching the collector plate and thus reducing the fiber diameter. Injection rate of the polymer solution is also effective on nanofibers' diameter, size, and shape so that, by decreasing the solution injection rate, the diameter of nanofibers reduced [Figure 1]b. It is well shown that when the fibers have enough time to dry before reaching a new fiber, they will be circular and have no beads, but fibers that do not dry well lead to the formation of wide ribbon-like fibers compared with circular cross-sectional fibers. Taylor showed that, if the rate of pass of solution from the needle is too much, the cone cannot stay at the tip of the needle. Megelski et al. examined the injection speed impact on polystyrene nanofiber structure in tetrahydrofuran (THF) solvent. They demonstrated that, when increasing the injection rate, fiber size increased. They changed the solution injection rate in the range of 0.004–0.24 ml/min. With an increase in flow rate, the diameter of nanofibers increased from 50 to 250 nm. At high speeds, a considerable number of beads were created because fibers did not dry well before reaching the collector. The distance of needle tip to the rotating plate was another processing variable which was studied. Not only it is effective on the size of nanofibers, but also determines whether the final product is electrospun or electrosprayed. When the distance of the needle to the rotating plate was changed between 15 and 23 cm, the best distance was 19 cm [Figure 1]c which caused the least nanofiber diameter. It becomes clear that this polymer has an optimal distance that, at distances greater or less than that, the diameter of the nanofiber increases. Doshi and Reneker  determined that, by increasing the distance, the fiber diameter decreases. In another study, Jaeger et al. prepared PEO nanofibers in water and examined the effect of distance. They found that, with increasing distance from 1 to 3.5 cm, diameter of the fibers declined from 19 to 9 μm. In addition, Megelski et al. showed that, over short distances, beads were created as the fibers did not dry well before reaching the collector plate. When they reduced the distance from 35 to 15 cm, the diameter of fibers increased from 70 to 200 nm. When spinning distance is reduced, fiber jet will have a shorter distance to reach the collector plate. In addition, the electric field strength increases and jet acceleration increases. As a result, there may not be enough time for evaporation of the solvent, in which case the thick fibers with beads are formed. Polymer concentration determines the spinning of a solution, i.e., whether or not the fiber is formed. Solution should be thick enough to form fiber chain. However, the solution cannot be too thin or too thick. The polymer concentrations used in this study were between 35 and 39 w/v%. By reducing the concentration of PMEVMA, nanofiber size reduced [Figure 1]d. Polymer concentration affects both viscosity and surface tension of the solution, both of which are very important parameters in the process of electrospinning. If the solution is too diluted, before reaching the collector, fibers are converted into drop due to low surface tension. However, if the solution is too thick, fibers cannot be formed due to high viscosity. Many studies have shown that, when increasing polymer concentration, the diameter of the fiber increases. Doshi and Reneker  showed that, when the viscosity of the PEO solution in water is <800 poise, they are sprayed as drops, while in viscosity above 4000 poise, it is so thick that it cannot be spun. Megelski et al. changed the polystyrene concentration from 18 to 35 w/v% in THF where the fiber diameter increased from 0.8 to 20 μ. They showed that, up to the concentration of 30% the fibers had beads, but more than that they were smooth. At low concentrations, solvent molecules tend to congregate and create spherical and bead shapes due to the influence of low surface tension of the solvent. With increase in concentration, viscosity increases, which can transfer bending instabilities to a farther distance than the tip of the needle. As a result, the jet route decreases, and bending instability extend at a smaller level. This reduction in the jet route ends up in less stretch of the solution and more diameter of the fibers. Nanofibers of PMVEMA containing montelukast were successfully spun. Results for electrospinning of PMVEMA solution showed that, by reducing the voltage, injection rate of the solution, and concentration of the polymer, nanofibers' size decreased. However, the variable of the distance between the tip of the needle to the rotating plate had a different effect on the diameter of the nanofibers. By reduction in the distance, initially, the nanofiber size decreased but then increased. Drug release from the optimized nanofibers was very fast and completed in <3 s. The drug loading percentage was 83% in the nanofibers. The results of this preliminary study show that the PMVEMA nanofibers can be a good candidate for preparing the fast-dissolving buccal dosage form of montelukast. Further studies are needed to study the pharmacokinetic profiles of this dosage form in comparison to its conventional tablets. The authors appreciate the financial support of Isfahan University of Medical Sciences. Elizondo E, Córdoba A, Sala S, Ventosa N, Veciana J. Preparation of biodegradable poly (methyl vinyl ether-co-maleic anhydride) nanostructured microparticles by precipitation with a compressed antisolvent. J Supercrit Fluids 2010;53:108-14. Popescu I, Suflet DM, Pelin IM, Chiţanu GC. Biomedical applications of maleic anhydride copolymers. Rev Roum Chim 2011;56:173-88. Wang Y, Chang F, Zhang Y, Liu N, Liu G, Gupta S, et al. Pretargeting with amplification using polymeric peptide nucleic acid. Bioconjug Chem 2001;12:807-16. Varshosaz J, Minaiyan M, Forghanian M. Prolonged hypocalcemic effect by pulmonary delivery of calcitonin loaded poly(methyl vinyl ether maleic acid) bioadhesive nanoparticles. Biomed Res Int 2014;2014:932615. Ali MS, Vijendar C, Sudheer Kumar D, Krishnaveni J. Formulation and evaluation of fast dissolving oral films of diazepam. J Pharmacovigil 2016;4:2329-6887. Mahajan A. Formulation & evaluation of fast dissolving buccal films of sertraline. Int J Drug Dev Res 2012;4:220-6. Kim SB, Lee JH, Lee J, Shin SH, Eun HS, Lee SM, et al. 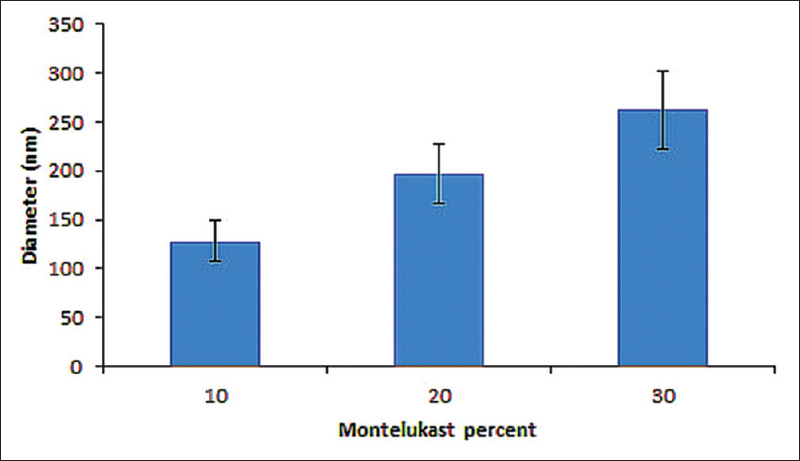 The efficacy and safety of montelukast sodium in the prevention of bronchopulmonary dysplasia. Korean J Pediatr 2015;58:347-53. Sarasija S, Pandit V, Joshi HP. Preparation and evaluation of mouth dissolving tablets of salbutamol sulphate. Indian J Pharm Sci 2007;69:467-9. Khatoon N, Raghavendra Rao NG, Reddy BM. Formulation and evaluation of oral fast dissolving films of montelukast sodium. Int J Pharm Sci Res 2014;5:1780-7. Jannesari M, Varshosaz J, Morshed M, Zamani M. Composite poly(vinyl alcohol)/poly(vinyl acetate) electrospun nanofibrous mats as a novel wound dressing matrix for controlled release of drugs. Int J Nanomedicine 2011;6:993-1003. Li X, Kanjwal MA, Lin L, Chronakis IS. Electrospun polyvinyl-alcohol nanofibers as oral fast-dissolving delivery system of caffeine and riboflavin. Colloids Surf B Biointerfaces 2013;103:182-8. Illangakoon UE, Gill H, Shearman GC, Parhizkar M, Mahalingam S, Chatterton NP, et al. Fast dissolving paracetamol/caffeine nanofibers prepared by electrospinning. Int J Pharm 2014;477:369-79. Wu YH, Yu DG, Li XY, Diao AH, Illangakoon UE, Williams GR. Fast-dissolving sweet sedative nanofiber membranes. J Mater Sci 2015;50:3604-13. Sill TJ, von Recum HA. Electrospinning: Applications in drug delivery and tissue engineering. Biomaterials 2008;29:1989-2006. Zamani M, Morshed M, Varshosaz J, Jannesari M. Controlled release of metronidazole benzoate from poly epsilon-caprolactone electrospun nanofibers for periodontal diseases. Eur J Pharm Biopharm 2010;75:179-85. Luu YK, Kim K, Hsiao BS, Chu B, Hadjiargyrou M. Development of a nanostructured DNA delivery scaffold via electrospinning of PLGA and PLA-PEG block copolymers. J Control Release 2003;89:341-53. Lee JY, Bashur CA, Goldstein AS, Schmidt CE. Polypyrrole-coated electrospun PLGA nanofibers for neural tissue applications. Biomaterials 2009;30:4325-35. Hsu CM, Shivkumar S. N, N-Dimethylformamide additions to the solution for the electrospinning of poly(e-caprolactone) nanofibers. Macromol Mater Eng 2004;289:334-40. Deitzel JM, Kleinmeyer J, Harris D, Tan NC. The effect of processing variables on the morphology of electrospun nanofibers and textiles. Polymer 2001;42:261-72. 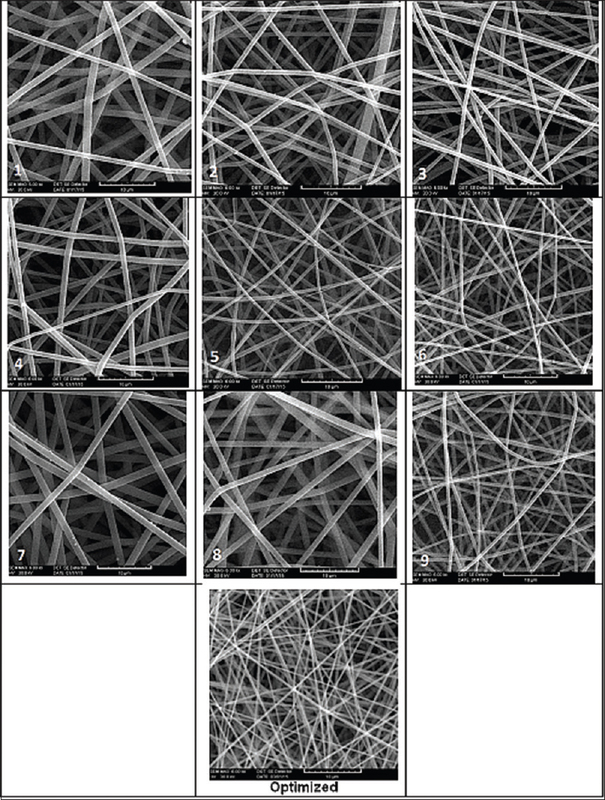 Meechaisue C, Dubin R, Supaphol P, Hoven VP, Kohn J. Electrospun mat of tyrosine-derived polycarbonate fibers for potential use as tissue scaffolding material. J Biomater Sci Polym Ed 2006;17:1039-56. Zhao S, Wu X, Wang L, Huang Y. Electrospinning of ethyl-cyanoethyl cellulose/tetrahydrofuran solutions. J Appl Polym Sci 2004;91:242-6. Taylor G. Electrically driven jets. Proc Natl Acad Sci London 1969;313:453-75. Megelski S, Stephens JS, Chase DB, Rabolt JF. Micro- and nanostructured surface morphology on electrospun polymer fibers. Macromolecules 2002;35:8456-66. Doshi J, Reneker DH. Electrospinning process and applications of electrospun fibers. J Electrostat 1995;35:151-60. Jaeger R, Bergshoef MM, Batlle CM, Schonherr H, Vancso GJ. Electrospinning of ultra-thin polymer fibers. Macromol Symp 1998;127:141-50. Ramakrishna S, Fujihara K, Teo WE, Lim TC, Ma Z. An Introduction to Electrospinning and Nanofibers. Singapore: World Scientific; 2005. p. 978-81. Mit-uppatham C, Nithitanakul M, Supaphol P. Ultrafine electrospun polyamide-6 fibers: Effect of solution conditions on morphology and average fiber diameter. Macromol Chem Phys 2004;205:2327-38.